Services for cleaning facades and windows are well in demand in big cities and small cities. The facades of multi-storey buildings need special care. Only with the help of competent cleaning and treatment with protective compounds can you give the facade a presentable look and guarantee durability. For buildings in which offices are located, the appearance is of paramount importance. It reflects the status of the company, so it’s important to make sure that the building looks beautiful, clean and pleasant to the eyes. In urban conditions, the facades of buildings are subjected to intensive effects of atmospheric precipitation, dust, exhaust gases, harmful emissions from industrial enterprises. All the dirt settles on the walls and windows of the buildings in which the company’s office is located. This affects the appearance of the facade. It becomes unpresentable and produces a depressing impression on the visitors and customers of the company. Washing of facades is carried out in difficult conditions. Specialists have to use industrial equipment and tools in order to carry out work at altitude. To carry out such activities, you need qualification and special permission. In addition to the difficulties with access to the facility, there are difficulties in removing persistent contaminants. Professional cleaning of facades by specialists of the company – solving complex problems using modern cleaning tools and technologies. Specialists use special cleaning agents that can cope with various types of pollution. Most often, they order the washing of facades with solid glazing. It is very important to keep such buildings clean. Dirt and dust settling on the glass, not only spoils the external appearance of the building, but also becomes visible to people inside the room. The presence of contaminants leads to a decrease in the light permeability of windows. To keep glass facades clean, specialists carry out the washing of the windows from the outside and cover the glass with special protective compounds. It is recommended to wash glass facades at least once or twice a year. If the building is located near a busy highway, then facade care should be carried out more often. 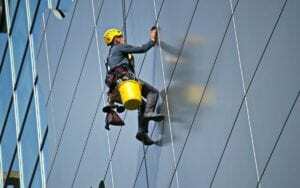 High-quality cleaning of the facades of multi-storey buildings is a guarantee of an attractive and presentable appearance. Your customers pay attention to the building in which the company is located. If the facade looks dirty and gloomy, this will negatively affect the perception of your company by consumers. Window сleaning companies offer cleaning of glass, ceramic granite, marble, brick, plastic, metal facades. The building of your company should be clean and attractive to new customers and visitors. Previous PostPrevious How Do You Reduce Dust When It’s Everywhere?